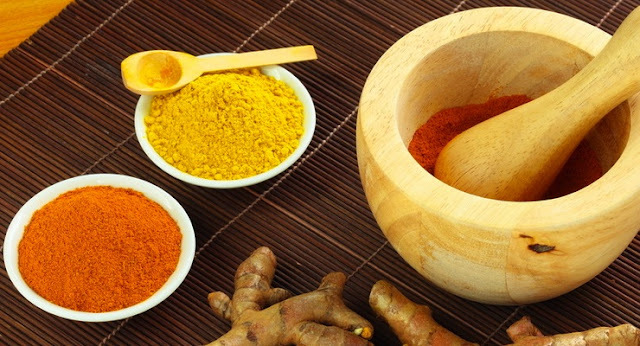 You may have heard the words curry powder, turmeric and curcumin used interchangeably. They are related but they aren’t the same thing. Turmeric is one of several spices used to make curry powder, an essential ingredient in south Asian cuisine. It’s usually used dry but the root can also be grated fresh like ginger. Turmeric has hundreds of known components but it’s mainly curcumin that gives this spice its distinctive golden hue. Curcumin is the active ingredient that makes this spice “gold” for your health as well. Turmeric has been used for healing for thousands of years going back to Ayurveda, India’s 5,000-year-old natural healing system. This versatile spice was used internally to improve digestion, dissolve gallstones, relieve arthritis, and alleviate symptoms of allergies and colds. Unlike turmeric, which has been used for healing for thousands of years, curcumin was identified only about 100 years ago. Curcumin is extracted from turmeric for its strong antioxidant and anti-inflammatory properties. But if you’re looking for optimal medicinal value from curcumin, there’s a quandary. Curcumin makes up only about 3% of most turmeric powders. And curry powders generally contain very little of the stuff. Curcumin either in turmeric or on its own is not very well absorbed. In fact, studies show that 40-85% of curcumin supplements pass through the intestines unchanged. Scientists are working on high-tech ways to make curcumin more bioavailable like using nanoparticles or combining it with phosphatidylserine. But it turns out that ancient cuisines worked out the answer to getting full turmeric benefits thousands of years ago. By adding black pepper to curry powder mix, it greatly increases the bioavailability of curcumin. It’s now known that the compound piperine found in black pepper increases curcumin absorption by a whopping 2000%. The bioavailability of curcumin is also increased when cooked in oil. Again, tradition has this covered. Indian cuisine liberally uses peanut, sesame and coconut oil, and butter-based ghee. Boiling turmeric in water, as is done to make turmeric tea, also increases bioavailability. So far, turmeric has been found to contain at least 20 compounds that are antibiotic, 14 known cancer preventatives, 12 that are anti-tumor, 12 anti-inflammatory, and at least 10 antioxidants. But of all the compounds in turmeric, curcumin is by far the most promising and is definitely the most widely studied. Curcumin benefits are derived from its natural anti-inflammatory, antioxidant, antiviral, antibacterial, antifungal, and anti-cancer properties. A quick look on Google Scholar gives over 160,000 results for scientific studies done on turmeric and curcumin health benefits. More research has been done on curcumin since it’s an isolated compound with effects that are more drug-like than a kitchen spice. Here’s a list of conditions that turmeric and curcumin have been found to help along with examples of promising scientific findings. Allergies and asthma have been on the rise, particularly in industrialized countries. Curcumin can help alleviate the symptoms of allergies by inhibiting histamine release from mast cells. It reduces both the inflammation and bronchospasms experienced by asthma sufferers. One of the most exciting turmeric benefits is that it may prevent Alzheimer’s. Elderly villagers in India who eat turmeric as a regular part of their cuisine have the lowest rate of Alzheimer’s in the world. Curcumin reduces the brain inflammation and breaks up brain plaques associated with Alzheimer’s. Curcumin’s natural anti-inflammatory properties rival those of nonsteroidal anti-inflammatory drugs (NSAIDs). When tested against drugs used to extinguish the pain and inflammation of arthritis, curcumin held its own. It performs as well as or even better than over-the-counter and prescription NSAIDs. Curcumin is more effective than anti-inflammatory drugs for rheumatoid arthritis. Test tube and animal studies suggest turmeric kills bacteria and viruses but so far this has not been proven in people. The National Center for Biodefense and Infectious Diseases is currently studying the effects of curcumin on Rift Valley fever. They plan to extend their research to other viruses including HIV. Curcumin is a potent antioxidant that readily crosses the blood-brain barrier. It can improve memory and concentration by increasing blood flow and neurotransmitter formation. There’s evidence that curcumin can boost levels of serotonin and dopamine. Curcumin increases levels of brain-derived neurotrophic factor (BDNF), a protein that stimulates brain cell production. Another compound in turmeric — turmerone — stimulates the production of new neurons. This makes it a potential candidate for treating neurological disorders, such as stroke and Alzheimer’s. Curcumin shows protective effects against many cancers including gastrointestinal, genitourinary, gynecological, hematological, pulmonary, thymic, brain, breast, and bone. Curcumin significantly inhibits growth of human breast cancer. Curcumin has been found to kill cancer cells by several diverse mechanisms. Its ability to selectively kill tumor cells while not harming normal cells makes curcumin an attractive candidate as a cancer treatment. Curcumin works synergistically with both chemotherapy and radiation treatments, increasing their effectiveness. Dr. Saraswati Sukumar is a cancer researcher at Johns Hopkins who has been involved in over 300 studies on the disease. In a recent interview, she revealed that she’s found food provides more turmeric benefits than supplements. Turmeric in capsules is very insoluble rendering them less effective. Three groups of patients with depression were given either curcumin or Prozac, or a combination of both. Somewhat surprisingly, curcumin supplements were as effective as Prozac. Patients who took both curcumin and Prozac fared best. Curcumin can help even major depressive disorder. If you have depression, turmeric or curcumin supplements can be taken indefinitely. They can safely be combined with antidepressant drugs or with other natural depression remedies such as St. John’s wort and SAMe. Curcumin holds promise for preventing and controlling diabetes. One study followed 240 pre-diabetic adults over 9 months. During that time, 19 of the placebo patients developed full-blown type 2 diabetes while none of the curcumin-taking patients did. Curcumin can mitigate diabetic complications including neuropathy. And since it tends to lower blood sugar levels, it shows promise as a drug-free way to control blood sugar levels. Using curcumin for digestive problems shows mixed results. While it can help ulcerative colitis, it can aggravate conditions like GERD and ulcers. Fatigue is such a common problem, you might even think it’s normal to need coffee to get through the day. Fatigue can be caused by your lifestyle or it can be a symptom of an underlying condition like fibromyalgia or chronic fatigue syndrome. aking curcumin supplements can dramatically decrease fatigue, particularly among the elderly. The use of curcumin after surgery reduces post-operative pain and fatigue. Curcumin significantly reduces oxidative stress and fatigue in chronic fatigue syndrome, making it a potential treatment for CFS. The antioxidant and anti-inflammatory effects of curcuminoids protects against atherosclerosis. Curcumin reduces post-bypass heart attack risk by 56%. Curcumin has been found to help alleviate obsessive actions and improve associated memory loss by increasing levels of the neurotransmitters dopamine and serotonin. Curcumin shows promise for treating Parkinson’s by preventing clumping of a protein found in the first stages of this disease. It is currently being studied as a Parkinson’s treatment by the Michael J. Fox Foundation. Psoriasis is a chronic, inflammatory skin condition. The usual medical treatment is the application of topical corticosteroids and sometimes phototherapy. Curcumin capsules were found to be a safe and effective adjunct to topical treatment. Twelve weeks of curcumin improved inflammatory markers by 48%. Results were so encouraging that researchers concluded that curcumin will be used more for treating psoriasis in the future. Curcumin can speed up the healing of wounds. Curcumin in combination with ginger promotes wound healing when used either orally or topically. Turmeric and curcumin are beginning to sound like miracle cures. And since they are natural they must be safe, right? There are almost no known turmeric side effects except for an increased risk of kidney stones in those susceptible. But we were surprised to learn that turmeric and curcumin supplements carry a large number of possible side effects, interactions, and warnings. While clearly turmeric and curcumin are not identical, their respective side effects and reactions are treated as one on sites like Drugs.com, RXlist.com, and the National Institutes of Health’s MedLine. You are pregnant. Curcumin stimulates the uterus and raises the risk of a miscarriage. The safety of this spice while breast feeding has not been established. You take medications that slow clotting such as aspirin, clopidogrel, diclofenac, ibuprofen, naproxen, and warfarin. This mix increases the risk of bruising and bleeding. You take drugs to reduce stomach acid. Turmeric can interfere with the actions of medications like Zantac, Tagamet, and Nexium, increasing the production of stomach acid. Some supplements contain piperine to enhance curcumin bioavailability. However piperine can also increase the bioavailability and slow the elimination of a number of drugs, including phenytoin, propranolol, and theophylline. Seventy drugs are known to interact adversely with curcumin and turmeric supplements. Look for products standardized for 95% curcuminoids that also contain piperine or black pepper extract. Follow the dosage instructions on labels. And they drink large amounts of turmeric tea. Boiling turmeric in water for 10 minutes increases the solubility of curcumin 12 times! To make basic turmeric tea, put 1/2 teaspoon of turmeric powder in 1 cup of water and simmer for 10 minutes. Strain if needed and serve. If you actually enjoy it, you’re in luck. Most people aren’t too crazy about it. It’s very bitter and medicinal-tasting. This recipe is tasty and assures maximum bioavailability due to the addition of coconut oil — one of our favorite healthy fats. You can substitute almond milk or regular milk for coconut milk. Ghee — traditional clarified Indian butter — works great instead of coconut oil and adds a rich buttery flavor. A good friend suggested adding a little rum to make a Hot Turmeric Toddy! You’ve heard all the pros and cons of turmeric health benefits found in food versus curcumin supplements. If you’re a little confused, I felt the same way when I started writing this article. Turmeric as a spice has a long history of safe and effective use. It’s known that when turmeric is cooked with oil, boiled, or combined with black pepper, its bioavailability is greatly increased. While there are turmeric capsules and turmeric tinctures available, their bioavailability is questionable and are more likely to cause side effects. Curcumin is an isolated compound with a relatively short history. It’s not always safe, especially if you are already taking any medications or have an existing health condition. If you decide to take a curcumin supplement look for a standardized extract that has taken measures to enhance bioavailability like the addition of piperine, phosphatidylserine, or the use of nano-particles. Otherwise your supplement may be passing straight through you. Cancer expert Dr. Saraswati Sukumar believes the liberal use of turmeric in cooking is all you need to get therapeutic amounts. We agree that it’s prudent to start first with turmeric in food and tea for that sweet spot of maximum benefits with virtually no risk of side effects. And if you don’t get the results you want, you can try turmeric supplements. If that still doesn’t bring the relief you’re looking for, then you can try curcumin supplements, staying mindful of interactions and side effects.